I am Professor of Cell Technology and have been a principle investigator at Durham University since 2000. My training and background is in animal cell biology with specific interests in anatomy, tissue biology, cell differentiation and stem cells. My research is both basic and applied, and has generated significant impact. Engineering human tissues in the laboratory creates multiple opportunities to advance basic research and discovery, develop new platforms for testing drugs and the safety assessment of chemicals, and importantly replacing the use of animals in research and development. My research group researches and develops innovative new strategies that enable the construction of human tissues in vitro. We specialise in enabling technologies that have multiple applications in academic and industrial research. We have created novel models of human skin, intestine, embryonic development, brain and liver. Much of our research is underpinned by basic principles in anatomy and physiology. Understanding how the micro-environment in which cells are cultured influences their structure and function is critical to generating models of human tissues that can be used as tools to improve our understanding of health and disease and enhance the predictive accuracy of drugs and use of cosmetics. To develop such technology, we research how cells are influenced by their surroundings and how we can control such factors in vitro to produce models of human tissue that mimic as close as possible their native counterparts. We examine carefully how the physical micro-environment influences cell shape and form through changes in its cytoskeleton reacting changes in the physical topography of their external surroundings. We study the effect of oxygen in vitro on cell and tissue growth, the impact of perfusion culture on generating 3D models. We develop and apply technology to control such factors, resulting in novel methods to generate tissue constructs as valuable research tools for the scientific community. Human stem cells play an important role in our work as a renewal source of material that can be used as the starting point to generate tissue models. Understanding their behaviour during differentiation and the application of the technologies we develop leads to enhanced in vitro systems to advance research and discovery. As a consequence of our research at Durham University, our work has significant impact and application in the academic and industrial sectors and has been widely adopted. We work at the interface between the disciplines of bioscience, chemistry, and engineering and collaborate extensively with other researchers in academia, industry and the government sectors. We are funded by the research councils, industry, and learned societies, developing new research tools that are used to understand the structure and function of human cells and tissues. We publish our work in peer-reviewed scientific journals and have recently published a new text on enabling platform technologies to build 3D human tissue models. 1: Hill, D.S., Robinson, N.D.P., Caley, M.P., Chen, M., O'Toole, E.A., Armstrong, J.L., Przyborski, S. & Lovat, P.E. (2015). A novel fully-humanised 3D skin equivalent to model early melanoma invasion. Molecular Cancer Therapeutics 14(11): 2665-2673. 2: Lopez-Real, R.E., Budge, J.J.R., Marder, T.B., Whiting, A., Hunt, P.N & Przyborski, S.A. (2014). Application of Synthetic Photostable Retinoids Induces Novel Limb and Facial Phenotypes During Chick Embryogenesis In Vivo. Journal of Anatomy 224(4): 392-411. 3: Ciechomska, M., O'Reilly, S., Przyborski, S., Oakley, F., Bogunia-Kubik, K. & van Laar, J.M. (2016). Histone demethylation and TLR8-dependent crosstalk in monocytes promotes trans-differentiation of fibroblasts in systemic sclerosis via Fra2. Arthritis & Rheumatology 68(6): 1493-1504. 4: Clarke, KE, Tams, DM, Henderson, AP, Roger, MF, Whiting, A & Przyborski, SA (2017). A robust and reproducible human pluripotent stem cell derived model of neurite outgrowth in a three-dimensional culture system and its application to study neurite inhibition. Neurochemistry International 106: 74-84. 6: Smith, I., Haag, M., Ugbode, C., Tams, D., Rattray, M., Przyborski, S., Bithell, A. & Whalley, B.J. (2015). Neuronal-glial populations form functional networks in a biocompatible 3D scaffold. Neuroscience Letters 609: 198-202. 7: Johnson, D.W., Langford, C.R., Didsbury, M.P., Lipp, B., Przyborski, S.A. & Cameron, N.R. (2015). Fully biodegradable and biocompatible emulsion template polymer scaffolds by thiol-acrylate polymerisation of polycaprolactone macropolymers. Polymer Chemistry 6(41): 7256-7263. 8: Yang, Chunbo, Xu, Yaobo, Yu, Min, Lee, David, Alharti, Sameer, Hellen, Nicola, Ahmad Shaik, Noor, Banaganapalli, Babajan, Sheikh Ali Mohamoud, Hussein, Elango, Ramu, Przyborski, Stefan, Tenin, Gennadiy, Williams, Simon, O’Sullivan, John, Al-Radi, Osman O., Atta, Jameel, Harding, Sian E., Keavney, Bernard, Lako, Majlinda & Armstrong, Lyle (2017). Induced pluripotent stem cell modelling of HLHS underlines the contribution of dysfunctional NOTCH signalling to impaired cardiogenesis. Human Molecular Genetics 26(16): 3031-3045. Przyborski, S.A. (2010). Alvetex: technology for routine three dimensional cell culture. Humana Press. Przyborski, S.A. (2007). Derivation and culture of human embryonal carcinoma stem cell lines. John Wiley & Sons. Andrews, P.W., Przyborski, S.A. & Thomson, J.A (2001). Embryonal Carcinoma Cells as Embryonic Stem Cells. Cold Spring Harbor Press. Hardy, S., Maltman, D. & Przyborski, S.A. (2010). Mesenchymal stem cells and their therapeutic applications. In Stem Cells: Basics and Applications. S. Totey & K. Deb McGraw Hill Publishing. Christie, V.B., Maltman, D., Whiting, A., Marder, T.M. & Przyborski, S.A. (2010). The development of small molecules and growth supplements to control the differentiation of stem cells and the formation of neural tissues. In Stem Cells and Regenerative Medicine. K. Appasani Springer Publishing. Anzilotti, Consuelo, Swan, David J., Boisson, Bertrand, Deobagkar-Lele, Mukta, Oliveira, Cathy, Chabosseau, Pauline, Engelhardt, Karin R., Xu, Xijin, Chen, Rui, Alvarez, Luis, Berlinguer-Palmini,Rolando Bull, Katherine R., Cawthorne, Eleanor, Cribbs, Adam P., Crockford, Tanya L., Dang, Tarana Singh, Fearn, Amy, Fenech, Emma J., de Jong, Sarah J. Lagerholm, B.Christoffer, Ma, Cindy S., Sims, David, van den Berg, Bert, Xu, Yaobo, Cant, Andrew J., Kleiner, Gary, Leahy, T. Ronan, de la Morena, M. Teresa, Puck, Jennifer M., Shapiro, Ralph S., van der Burg, Mirjam, Chapman, J. Ross, Christianson, John C., Davies, Ben, McGrath, John A., Przyborski, Stefan, Koref, Mauro Santibanez, Tangye, Stuart G., Werner, Andreas, Rutter, Guy A., Padilla-Parra, Sergi, Casanova, Jean-Laurent, Cornall, Richard J., Conley, Mary Ellen & Hambleton, Sophie (2019). An essential role for the Zn2+ transporter ZIP7 in B cell development. Nature Immunology 20: 350-361. Buskin, Adriana, Zhu, Lili, Chichagova, Valeria, Basu, Basudha, Mozaffari-Jovin, Sina, Dolan, David, Droop, Alastair, Collin, Joseph, Bronstein, Revital, Mehrotra, Sudeep, Farkas, Michael, Hilgen, Gerrit, White, Kathryn, Pan, Kuan-Ting, Treumann, Achim, Hallam, Dean, Bialas, Katarzyna, Chung, Git, Mellough, Carla, Ding, Yuchun, Krasnogor, Natalio, Przyborski, Stefan, Zwolinski, Simon, Al-Aama, Jumana, Alharthi, Sameer, Xu, Yaobo, Wheway, Gabrielle, Szymanska, Katarzyna, McKibbin, Martin, Inglehearn, Chris F., Elliott, David J., Lindsay, Susan, Ali, Robin R., Steel, David H., Armstrong, Lyle, Sernagor, Evelyne, Urlaub, Henning, Pierce, Eric, Lührmann, Reinhard, Grellscheid, Sushma-Nagaraja, Johnson, Colin A. & Lako, Majlinda (2018). Disrupted alternative splicing for genes implicated in splicing and ciliogenesis causes PRPF31 retinitis pigmentosa. Nature Communications 9(1): 4234. Melguizo-Sanchis, Dario, Xu, Yaobo, Taheem, Dheraj, Yu, Min, Tilgner, Katarzyna, Barta, Tomas, Gassner, Katja, Anyfantis, George, Wan, Tengfei, Elango, Ramu, Alharthi, Sameer, El-Harouni, Ashraf A., Przyborski, Stefan, Adam, Soheir, Saretzki, Gabriele, Samarasinghe, Sujith, Armstrong, Lyle & Lako, Majlinda (2018). iPSC modeling of severe aplastic anemia reveals impaired differentiation and telomere shortening in blood progenitors. Cell Death & Disease 9(2): 128. Haffez, H., Khatib, T., McCaffery, P., Przyborski, S., Redfern, C. & Whiting, A. (2018). Neurogenesis in Response to Synthetic Retinoids at Different Temporal Scales. Molecular Neurobiology 55(3): 1942-1950. Welsh, Ciaran M., Fullard, Nicola, Proctor, Carole J., Martinez-Guimera, Alvaro, Isfort, Robert J., Bascom, Charles C., Tasseff, Ryan, Przyborski, Stefan A. & Shanley, Daryl P. (2018). PyCoTools: a Python toolbox for COPASI. Bioinformatics 34(21): 3702-3710. Przyborski, Stefan (2017). Advanced cell culture technology for generation of in vivo-like tissue models. International Journal of Health, Animal Science and Food Safety 4(1). Hallam, Dean, Collin, Joseph, Bojic, Sanja, Chichagova, Valeria, Buskin, Adriana, Xu, Yaobo, Lafage, Lucia, Otten, Elsje. G., Anyfantis, George, Mellough, Carla, Przyborski, Stefan, Alharthi, Sameer, Korolchuk, Viktor, Lotery, Andrew, Saretzki, Gabriele, McKibbin, Martin, Armstrong, Lyle, Steel, David, Kavanagh, David & Lako, Majlinda (2017). An iPSC Patient Specific Model of CFH (Y402H) Polymorphism Displays Characteristic Features of AMD and Indicates a Beneficial Role for UV Light Exposure. STEM CELLS 35(11): 2305-2320. Horsburgh, Steven, Fullard, Nicola, Roger, Mathilde, Degnan, Abbie, Todryk, Stephen, Przyborski, Stefan & O’Reilly, Steven (2017). MicroRNAs in the skin: role in development, homoeostasis and regeneration. Clinical Science 131(15): 1923-1940. Martinez Guimera, Alvaro, Welsh, Ciaran, Dalle Pezze, Piero, Fullard, Nicola, Nelson, Glyn, Roger, Mathilde F., Przyborski, Stefan A. & Shanley, Daryl P. (2017). Systems modelling ageing: from single senescent cells to simple multi-cellular models. Essays In Biochemistry 61(3): 369-377. Collin, J., Mellough, C.B., Dorgau, B., Przyborski, S., Moreno-Gimeno, I. & Lako, M. (2016). Using Zinc Finger Nuclease Technology to Generate CRX-Reporter Human Embryonic Stem Cells as a Tool to Identify and Study the Emergence of Photoreceptors Precursors During Pluripotent Stem Cell Differentiation. STEM CELLS 34(2): 311-321. Knight, Eleanor & Przyborski, Stefan (2015). Advances in 3D cell culture technologies enabling tissue-like structures to be created in vitro. Journal of Anatomy 227(6): 746-756. Tilgner, K., Neganova, I., Moreno-Gimeno, I., Al-Aama, J.Y., Burks, D., Yung, S., Singhapol, C., Saretzki, G., Evans, J., Gorbunova, V., Gennery, A., Przyborski, S., Stojkovic, M., Armstrong, L., Jeggo, P. & Lako, M. (2013). A human iPSC model of Ligase IV deficiency reveals an important role for NHEJ-mediated-DSB repair in the survival and genomic stability of induced pluripotent stem cells and emerging haematopoietic progenitors. Cell Death and Differentiation 20(8): 1089-1100. Moad, M., Pal, D., Hepburn, A.C., Williamson, S.C., Wilson, L., Lako, M., Armstrong, L., Hayward, S.W., Franco, O.E., Cates, J.M., Fordham, S.E., Przyborski, S., Carr-Wilkinson, J., Robson, C.N. & Heer, R. (2013). A novel model of urinary tract differentiation, tissue regeneration, and disease: reprogramming human prostate and bladder cells into induced pluripotent stem cells. European Urology 64(5): 753-761. Hayward, A.S., Sano, N., Przyborski, S.A. & Cameron, N.R. (2013). Acrylic-acid-functionalized PolyHIPE scaffolds for use in 3D cell culture. Macromolecular Rapid Communications 34(23-24): 1844-1849. Tilgner, K, Neganova, I, Singhapol, C, Saretzki, G, Al-Aama, JY, Evans, J, Gorbunova, V, Gennery, A, Przyborski, S, Stojkovic, M, Armstrong, L, Jeggo, P & Lako, M (2013). Brief report: a human induced pluripotent stem cell model of cernunnos deficiency reveals an important role for XLF in the survival of the primitive hematopoietic progenitors. Stem cells 31(9): 2015-2023. Yung, SK, Tilgner, K, Ledran, MH, Habibollah, S, Neganova, I, Singhapol, C, Saretzki, G, Stojkovic, M, Armstrong, L, Przyborski, S & Lako M. (2013). Brief report: human pluripotent stem cell models of fanconi anemia deficiency reveal an important role for fanconi anemia proteins in cellular reprogramming and survival of hematopoietic progenitors. Stem cells 31(5): 1022-1029. Clemens, G., Flower, K.R., Gardner, P., Henderson, A. P., Knowles, J. P., Marder, T. B., Whiting, A. & Przyborski, S. A. (2013). Design and biological evaluation of synthetic retinoids: Probing length vs. stability vs. activity. Molecular BioSystems 9(12): 3124-3134. Hayward, A.S., Eissa, A.M., Maltman, D.J., Przyborski, S.A. & Cameron, N.R. (2013). Galactose-Functionalized PolyHIPE Scaffolds for Use in Routine Three Dimensional Culture of Mammalian Hepatocytes. Biomacromolecules 14(12): 4271–4277. Ljujic, B., Milovanovic, M., Volarevic, V., Murray, B., Bugarski, D., Przyborski, S., Arsenijevic, N., Lukic, M.L. & Stojkovic, M. (2013). Human mesenchymal stem cells creating an immunosuppressive environment and promote breast cancer in mice. Scientific Reports 3: 2298. Godoy, P., Hewitt, N.J., Albrecht, U., Andersen, M.E., Ansari, N., Bhattacharya, S., Bode, J.G., Bolleyn, J., Borner, C., Böttger, J., Braeuning, A., Budinsky, R.A., Burkhardt, B., Cameron, N.R., Camussi, G., Cho, C.S., Choi, Y.J., Craig, Rowlands J., Dahmen, U., Damm, G., Dirsch, O., Donato, M.T., Dong, J., Dooley, S., Drasdo, D., Eakins, R., Ferreira, K.S., Fonsato, V., Fraczek, J., Gebhardt, R., Gibson, A., Glanemann, M., Goldring, C.E., Gómez-Lechón, M.J., Groothuis, G.M., Gustavsson, L., Guyot, C., Hallifax, D., Hammad, S., Hayward, A., Häussinger, D., Hellerbrand, C., Hewitt, P., Hoehme, S., Holzhütter, H.G., Houston, J.B., Hrach, J., Ito, K., Jaeschke, H., Keitel, V., Kelm, J.M., Kevin Park, B., Kordes, C., Kullak-Ublick, G.A., LeCluyse, E.L., Lu, P., Luebke-Wheeler, J., Lutz, A., Maltman, D.J., Matz-Soja, M., McMullen, P., Merfort, I., Messner, S., Meyer, C., Mwinyi, J., Naisbitt, D.J., Nussler, A.K., Olinga, P., Pampaloni, F., Pi, J., Pluta, L., Przyborski, S.A., Ramachandran, A., Rogiers, V., Rowe, C., Schelcher, C., Schmich, K., Schwarz, M., Singh, B., Stelzer, E.H., Stieger, B., Stöber, R., Sugiyama, Y., Tetta, C., Thasler, W.E., Vanhaecke, T., Vinken, M., Weiss, T.S., Widera, A., Woods, C.G., Xu, J.J., Yarborough, K.M. & Hengstler, J.G. (2013). Recent advances in 2D and 3D in vitro systems using primary hepatocytes, alternative hepatocyte sources and non-parenchymal liver cells and their use in investigating mechanisms of hepatotoxicity, cell signaling and ADME. Archives of Toxicology 87(8): 1315-1530. Zhou, G.-L., Tams, D. M., Marder, T. B., Valentine, R., Whiting, A. & Przyborski, S. A. (2013). Synthesis and applications of 2,4-disubstituted thiazoles derivatives as small molecule modulators of cellular development. Organic & Biomolecular Chemistry 11(14): 2323-2334. Clemens, G., Flower, K. R., Henderson, A. P., Whiting, A., Przyborski, S. A., Jimenez-Hernandez, M., Ball, F., Bassan, P., Cinque, G. & Gardner, P. (2013). The action of all-trans-retinoic acid (ATRA) and synthetic retinoid analogues (EC19 and EC23) on human pluripotent stem cells differentiation investigated using single cell infrared microspectroscopy. Molecular BioSystems 9(4): 677-692. Burkard, A, Dahn, C, Heinz, S, Zutavern, A, Sonntag-Buck, V, Maltman, D, Przyborski, S, Hewitt, N.J & Braspenning, J. (2012). Generation of proliferating human hepatocytes using upcyte technology: characterisation and applications in induction and cytotoxicity assays. Xenobiotica 42: 939-956. Maltman, D.J, Brand, S, Belau, E, Paape, R, Suckau, D & Przyborski, S.A (2012). Top-Down Label-Free LC-MALDI analysis of the peptidome during neural progenitor cell differentiation reveals complexity in cytoskeletal protein dynamics and identifies progenitor cell markers. Stem Cells (30): 599-611. Knight E, Murray B, Carnachan R & Przyborski S. (2011). Alvetex® polystyrene scaffold technology for routine three dimensional cell culture. Methods in Molecular Biology 695: 323-340. Maltman, DJ, Brand, S, Belau, E, Paape, R, Suckau, D & Przyborski, SA (2011). Top-down label-free LC-MALDI analysis of the peptidome during neural progenitor cell differentiation reveals complexity in cytoskeletal protein dynamics and identifies progenitor cell markers. Proteomics 11(20): 3992-4006. Maltman, D.J. & Przyborski, S.A (2010). Developments in three dimensional cell culture technology aimed at improving the accuracy of in vitro analyses. Biochemical Society Transactions 38(4): 1072-1075. Armstrong, L., Tilgner, K., Saretzki, G., Atkinson, S.P., Stojkovic, M., Moreno, R., Przyborski, S. & Lako, M. (2010). Human induced pluripotent stem cell line shows similar stress defense mechanisms and mitochondrial regulation to human embryonic stem cells. Stem Cells 28: 661-673. Foster, C.R., Przyborski, S.A., Wilson, R.G. & Hutchison, C.J. (2010). Lamins as cancer biomarkers. Biochemical Society Transactions 38(1): 297-300. Cooke, MJ, Zahir, T, Phillips, SR, Shah, DSH, Athey, D, Lakey, JH, Shoichet, MS & Przyborski, SA (2010). Neural differentiation regulated by biomimetic surfaces presenting motifs of extracellular matrix proteins. Journal of Biomedical Materials Research Part A 93A(3): 824-832. Christie VB, Maltman DJ, Henderson AP, Whiting A, Marder TB, Lako M & Przyborski SA. (2010). Retinoid supplementation of differentiating human neural progenitors and embryonic stem cells leads to enhanced neurogenesis in vitro. Journal of Neuroscience Methods 193(2): 239-245. Fox BC, Devonshire AS, Schutte ME, Foy CA, Minguez J, Przyborski S, Maltman D, Bokhari M & Marshall D. (2010). Validation of reference gene stability for APAP hepatotoxicity studies in different in vitro systems and identification of novel potential toxicity biomarkers. Toxicology in Vitro 24(7): 1962-1970. Ahmad, S., Kolli, S., Li, D, Paiva, C., Przyborski, S., Dimmick, I., Armstrong, L., Figueiredo, F. & Lako, M (2009). A putative role for RHAMM/HMMR as a negative marker of stem cell-containing population of human limbal epithelial cells. Stem Cells 26: 1609-1619. De Sousa, P.A., Gardner, J., Sneddon, S., Pells, S., Tye, B., Dand, P., Collins, D.M., Stewart, K., Przyborski, S., Cooke, M., McLauglin, K.J., Kimber, S.J., Lieberman, B., Wilmut, I. & Brison, D.R. (2009). Clinically failed eggs as a source of normal human embryo stem cells. Stem Cell Research 2: 188-197. Croft, A.P. & Przyborski, S.A (2009). Mesenchymal stem cells expressing neural antigens instruct a neurogenic cell fate on neural stem cells. Experimental Neurology 216(2): 329-341. Zhang, X., Neganova, I., Przyborski, S., Yang, C., Cooke, M., Atkinson, S.P., Anyfantis, G., Fenyk, S., Nicol Keith, W., Hoare, S.F., Hughes, O., Strachan, T., Stojkovic, M., Armstrong, L. & Lako, M (2009). NANOG regulates S pahse entry and progression in human embryonic stem cells through activation of CDK6 and CD25A. Journal of Cell Biology 184: 67-82. Barnard, J.H., Collings, J.C., Whiting, A., Przyborski, S.A. & Marder, T.B (2009). Synthetic retinoids: structure-activity relationships. Chemical European Journal 15: 11430-11452. Yang, C., Przyborski, S., Cooke, M.J., Zhang, X., Stewart, R., Atkinson, S., Saretzki, G., Armstrong, L. & Lako, M (2008). A key role for telomerase reverse transcriptase unit (TERT) in modulating human ESC proliferation, cell cycle dynamics and in vitro differentiation. Stem Cells 26(4): 850-863. Willis, N.D., Przyborski, S.A., Hutchison, C.J. & Wilson, R.G. (2008). Colonic cancer stem cells: progress in searching for putative biomarkers. Journal of Anatomy 213: 59-65. Carnachan, R.J., Bokhari, M., Maatta, A., Cameron, N.R. & Przyborski, S.A. (2008). Emulsion-templated porous scaffolds enabling three dimensional cell culture. Polymer Preprints (American Chemical Society, Division of Polymer Chemistry) 418-419. Cooke, MJ, Phillips, SR, Shah, DSH, Athey, D, Lakey, JH & Przyborski, SA (2008). Enhanced cell attachment using a novel cell culture surface presenting functional domains from extracellular matrix proteins. Cytotechnology 56(2): 71-79. Willis, ND, Rahman-Casans, SF, Cox, TR, Smits, KM, Przyborski, SA, van den Brandt, PA, van Engeland, M, Weijenberg, MP, Wilson, RG, de Bruine, A & Hutchison, CJ (2008). Lamin A/C: a putative adult colonic stem cell and colorectal cancer marker. Journal Of Anatomy 212(1): 77-78. Hardy, S.A., Maltman, D.J. & Przyborski, S.A (2008). Mesenchymal stem cells as mediators of neural differentiation. Current Stem Cell Research 3: 43-52. Mellough, CB, Wood, A & Przyborski, SA (2008). Neuritogenesis in adult hippocampal neurons grown in growth-permissive versus inhibitory environments in vitro. Journal Of Anatomy 212(1): 87-87. Cooke, MJ, Phillips, S, Shah, DS, Athey, D, Lakey, JH & Przyborski, SA (2008). Presentation of extracellular matrix motifs by biomimetic substrates to control cellular attachment and differentiation. Journal Of Anatomy 212(1): 89-89. Stewart R, Yang C, Anyfantis G, Przyborski S, Hole N, Strachan T, Stojkovic M, Keith WN, Armstrong L & Lako M (2008). Silencing of the expression of pluripotent driven-reporter genes stably transfected into human pluripotent cells. Regenerative Medicine 3(4): 505-522. Christie, V. B., Barnard, J. H., Batsanov, A. S., Bridgens, C. E., Cartmell, E. B., Collings, J. C., Maltman, D. J., Redfern, C. P. F., Marder, T. B., Przyborski, S. & Whiting, A. (2008). Synthesis and evaluation of synthetic retinoid derivatives as inducers of stem cell differentiation. Journal of Organic & Biomolecular Chemistry 6(19): 3497-3507. Christie, VB, Collings, J, Whiting, A, Marder, TB & Przyborski, SA (2008). Synthetic retinoid analogues induce model cell culture systems to differentiate down a neural lineage. Journal Of Anatomy 212(1): 86-86. Christie, VB, Marder, TB, Whiting, A & Przyborski, SA (2008). The role of retinoids in the adult nervous system and their therapeutic potential. Mini-reviews In Medicinal Chemistry 8(6): 601-608. Carnachan, R., Bokhari, M., Cameron, N., Maatta, A. & Przyborski, S.A (2008). Three Dimensional Cell Culture. Trends and Techniques in Life Science Research 12(4): 30-32. Bokhari, M., Carnachan, R., Cameron, N., Maatta, A. & Przyborski, S.A. (2008). 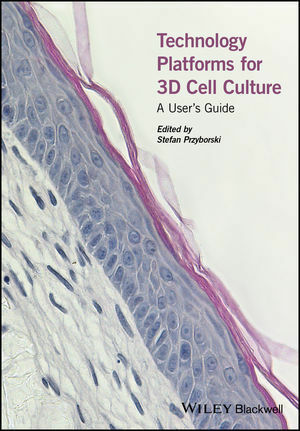 Three dimensional cell culture: developing technology to enhance cell behaviour in vitro. Screening: Trends in Drug Discovery 9(1): 30-32. Maltman, D.J. & Przyborski, S.A. (2007). Application of proteomic technology to neural stem cell science and neurology. Future Neurology 2: 285-296. Maltman, D.J. & Przyborski, S.A (2007). Can large-scale analysis of the proteome identify effective new markers for embryonic stem cells? Regenerative Medicine 2: 465-469. Bokhari, M., Carnachan, R., Cameron, N.R. & Przyborski, S.A (2007). Culture of HepG2 liver cells on three dimensional polystyrene scaffolds enhances cell structure and function during toxicological challenge. Journal of Anatomy 211: 567-576. Bokhari, M., Carnachan, R., Przyborski, S.A. & Cameron, N.R (2007). Effect of synthesis parameters on emulsion-templated porous polymer formation and evaluation for 3D cell culture scaffolds. Journal of Materials Chemistry 17: 4088-4094. Casans, SFR, Willis, ND, Cox, TR, Smits, KM, Przyborski, SA, van den Brandt, PA, van Engeland, M, Weijenberg, M, de Bruine, A, Hutchison, CJ & Wilson, RG (2007). Expression of colonic stem cell markers in colorectal cancer correlates with a poor prognosis. Gut 56: 071. Gertow, K., Przyborski, S.A., Loring, J.F., Auerbach, J.M., Epifano, O., Otonkoski, T., Damjanov, I. & Ahrlund-Richter, L (2007). Isolation of human embryonic stem cell-derived teratomas for the assessment of pluripotency. Current Protocols in Stem Cell Biology Chapt 1B.4: 1-24. Bokhari, M., Carnachan, R., Cameron, N.R. & Przyborski, S.A (2007). Novel cell culture device enabling three-dimensional cell growth and improved cell function. Biochemical and Biophysical Research Communications, 354: 1095-1100. Ziabreva, I., Perry, E., Perry, R., Minger, S.L., Ekonomou, A., Przyborski, S. & Ballard, C. (2006). Altered neurogenesis in Alzheimer's disease. Journal of Psychosomatic Research 61: 311-316. Hayman, MW, Christie, VB, Keating, TS & Przyborski, SA (2006). Following the differentiation of human pluripotent stem cells by proteomic identification of biomarkers. Stem Cells And Development 15(2): 221-231. Croft, A.P. & Przyborski, S.A. (2006). Formation of neurons by non-neural adult stem cells: potential mechanism implicates an artifact of growth in culture. Stem Cells 24(8): 1841-1851. Cooke, MJ, Stojkovic, M & Przyborski, SA (2006). Growth of teratomas derived from human pluripotent stem cells is influenced by the graft site. Stem Cells And Development 15(2): 254-259. R. J. Carnachan, M. Bokhari, S. A. Przyborski & N. R. Cameron (2006). Tailoring the morphology of emulsion-templated porous polymers. Soft Matter 2(7): 608-616. Stojkovic, P., Lako, M., Stewart, R., Przyborski, S.A., Armstrong L., Evans, J., Murdoch A., Strachan T. & Stojkovic, M. (2005). An autogenic feeder cell system that efficiently supports growth of undifferentiated human embryonic stem cells. Stem Cells 23: 306-314. Przyborski S.A. (2005). Differentiation of human embryonic stem cells following transplantation into immune deficient mice. Stem Cells 23: 1242-1250. Hyslop, L., Stojkovic, M., Armstrong, L., Walter, T., Stojkovic, P., Przyborski, S.A., Herbert, M., Murdoch, A., Strachan, T. & Lako, M. (2005). Downregulation of NANOG induces differentiation of human embryonic stem cells to extraembryonic lineages. Stem Cells 23: 1035-1043. Hayman, M.W., Smith, K.H., Cameron, N.R. & Przyborski, S.A. (2005). Growth of human stem cell-derived neurons on solid three dimensional polymers. Journal of Biochemical and Biophysical Methods 62: 231-240. Hayman, MW, Smith, KH, Cameron, NR & Przyborski, SA (2005). Growth of human stem cell-derived neurons on solid three-dimensional polymers. Journal Of Biochemical And Biophysical Methods 62(3): 231-240. Stojkovic, P., Lako, M., Przyborski, S.A., Stewart, R., Armstrong L., Evans, J., Murdoch A., Strachan T. & Stojkovic, M. (2005). Human-serum matrix supports undifferentiated growth of human embryonic stem cells. Stem Cells 23: 895-902. Stewart, R., Lako, M., Horrocks, G.M. & Przyborski, S.A. (2005). Investigating neural development by transplantation of human embryonal carcinoma stem cells expressing green fluorescent protein. Cell Transplantation 14: 339-351. Stewart, R, Lako, M, Horrocks, GM & Przyborski, SA (2005). Neural development by transplanted human embryonal carcinoma stem cells expressing green fluorescent protein. Cell Transplantation 14(6): 339-351. Mellough, C., Wood, A. & Przyborski, S.A. (2005). Pharmaceutical manipulation of neuroprogenitor pathways in situ: possibilities for neural restoration in the injured adult brain. Current Medicinal Chemistry 5: 67-81. Barbetta, A., Carnachan, R.J., Smith, K.H., Zhao, C.T., Cameron, N.R., Kataky, R., Hayman, M., Przyborski, S.A. & Swan, M. (2005). Porous polymers by emulsion templating. Macromolecular symposia 226(1): 203-212. Stewart, R. & Przyborski, S. A. (2004). Changes in oxygen concentration modulate neural differentiation in human embryonal carcinoma stem cells. Journal Of Anatomy 205(6): 535-535. Stojkovic, M., Lako, M., Stojkovic, P., Stewart, R., Przyborski, S.A., Armstrong L., Evans J., Herbert M., Hyslop L., Ahmad S., Murdoch A. & Strachan T. (2004). Derivation of human embryonic stem cells from day 8 blastocysts recovered after three-step in vitro culture. Stem Cells 22: 790-797. Horrocks, G.M. & Przyborski, S.A. (2004). Determination of neural and epithelial cell fate in the human embryonic ectoderm the role of bone morphogenetic proteins. Journal Of Anatomy 205(6): 525-525. Hayman, M.W., Smith, K.H., Cameron, N.R. & Przyborski, S.A. (2004). Enhanced neurite outgrowth by human neurons grown on solid three-dimensional scaffolds. Biochemical and Biophysical Research Communications, 314(2): 483-488. Croft, AP & Przyborski, SA (2004). Generation of neuroprogenitor-like cells from adult mammalian bone marrow stromal cells in vitro. Stem Cells And Development 13(4): 409-420. Przyborski, S.A., Christie, V.B., Hayman, M.W., Stewart, R. & Horrocks, G.M. (2004). Human embryonal carcinoma cells: models of human embryonic development in man. Stem Cells and Development 13: 400-408. Stewart, R, Coyne, L, Lako, M, Halliwell, RF & Przyborski, SA (2004). Human embryonal carcinoma stem cells expressing green fluorescent protein form functioning neurons in vitro: A research tool for co-culture studies. Stem Cells And Development 13(6): 646-657. Przyborski, SA, Christie, VB, Hayman, MW, Stewart, R & Horrocks, GM (2004). Human embryonal carcinoma stem cells: Models of embryonic development in humans. Stem Cells And Development 13(4): 400-408. Croft, A.P. & Przyborski, S.A. (2004). Mesenchymal stem cells from the bone marrow stroma: basic biology and potential for cell therapy. Current Anaesthesia and Critical Care 15: 410-417. Hayman, MW & Przyborski, SA (2004). Proteomic identification of biomarkers expressed by human pluripotent stem cells. Biochemical And Biophysical Research Communications 316(3): 918-923. Horrocks G.M., Lauder L., Stewart R. & Przyborski S.A. (2003). Formation of neurospheres from human embryonal carcinoma stem cells. Biochemical and Biophysical Research Communications 304: 411-416. Stewart R., Christie V. & Przyborski S.A. (2003). Manipulation of human pluripotent embryonal carcinoma stem cells and the development of neural subtypes. Stem Cells 21(3): 248-256. Przyborski, S.A., Smith, S. & Wood, A. (2003). Transcriptional profiling of neuronal differentiation by human embryonal carcinoma stem cells in vitro. Stem Cells 21(4): 459-471. Stewart, R. & Przyborski S.A. (2002). Non-neural Adult Stem Cells: Tools for Brain Repair?. BioEssays 24: 708-713. Edgar J.H., Bronson R.T., Harris B., Johnson K., Przyborski S.A. & Ackerman, S.L. (2002). Unc5h3 and Dcc are necessary at multiple choice points for the guidance of corticospinal tract axons. Journal of Neuroscience 22: 10346-10356. Przyborski S.A. (2001). Isolation of human embryonal carcinoma stem cells by immuno-magnetic sorting. Stem Cells 19(6): 500-504. Przyborski, SA (2001). Isolation of human embryonal carcinoma stem cells by immunomagnetic sorting. Stem Cells 19(6): 500-504. Przyborski S.A., Morton I.E., Wood A. & Andrews P.W. (2000). Developmental regulation of neurogenesis in the pluripotent human embryonal carcinoma cell line NTERA2. European Journal of Neuroscience 12: 3521-3528. Goldowitz D., Hamre K.M., Przyborski S.A. & Ackerman S.L. (2000). Granule cells and cerebellar boundaries: Analysis of Unc5h3 mutant chimeras. Journal of Neuroscience 20: 4129-4137.